With a staff of nearly 200 and approximately 350 volunteers, we care for an average of 275 patients and their families daily. Since opening our doors in 1978, services have been provided to more than 65,000 patients and families at the most critical time in their lives regardless of ethnicity, gender, age, religion, disease, insurance status, or ability to pay. THE MISSION OF ELIZABETH HOSPICE from Love Machine Films on Vimeo. 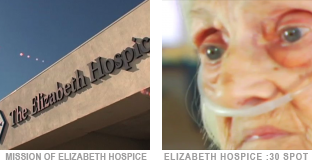 THE ELIZABETH HOSPICE TV SPOT from Love Machine Films on Vimeo.